Lin Dan in the game against teammate Shi Yuqi. 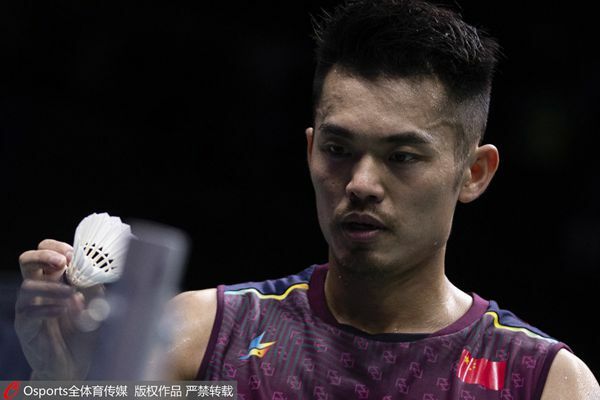 Lin Dan said he has no plans to retire after the Chinese badminton legend's bid for a sixth world title met a sorry end yesterday in the last 16. The 34-year-old "Super Dan" was the most high-profile casualty on a day when men's No. 1 and reigning champion Viktor Axelsen of Denmark and women's No. 1 Tai Tzu-ying of Chinese Taipei progressed into the quarterfinals of the world championships in Nanjing. Lin, a two-time Olympic and five-time world champion, may be reaching the end of his career but he remains the biggest draw in badminton. The crowd willed him on against his higher-ranked compatriot Shi Yuqi, 22, but Lin bowed out with a whimper, 15-21, 9-21. Asked if he might now call it a day, Lin said: "It's been the same old question ever since I played Chen Long at the world championships in 2013 (when Lin won it). "This actually makes me feel proud. Although I lost the match today, I'll discuss with my team to see what I could learn from it and hopefully improve my world rankings in the next tournaments this year. "This is my 11th world championships and I will continue to fight as long as I still have the capability and time." The 24-year-old Axelsen pulled through against 10th seed Angus Ng Ka-long of China's Hong Kong and will play China's Olympic champion Chen Long in a mouthwatering showdown today. Axelsen admitted that he was not at his best — so it helped that he was able to draw on the crowd, who have taken to the Dane partly because of his efforts to learn Chinese. Having a good grasp of Mandarin helps in a sport where many players are Chinese or of Chinese descent. Axelsen has been learning for about four years and can give interviews in the language. He has even taken to translating for his rivals and he can also listen in on the tactics of his Chinese opponents. "It really helps me communicate with my Chinese fans and I really appreciate all the support out here," he said. "Having the Chinese fans yelling your name, I really appreciate that." Axelsen won the first game 21-19, then he and Ng went toe-to-toe in the second, before the Dane prevailed 21-18. He celebrated with a swing of his fist. "It meant a lot. Sometimes when you feel like you are not at your highest level, you also have to be able to win," he said. "I struggled a little bit to win it and that's why I showed some emotions out there today," he added, before passing a couple of Chinese players and exchanging pleasantries — in Chinese. Unseeded Darren Liew of Malaysia upset fifth-seeded Kidambi Srikanth of India 21-18, 21-8, and joined Asian champion Kenta Momota of Japan and Chou Tien-chen of Chinese Taipei in the quarterfinals. In the women's draw, hot favorite Tai recovered from a slow start to book her place in the last eight and a clash with China's sixth seed He Bingjiao. Tai was behind in the opening exchanges against Zhang Beiwen, the Chinese-born American who needed internet crowd funding to make it to Nanjing. But the 24-year-old Tai's quality shone through, winning 21-19, 21-14 in 34 minutes. Tai has looked unstoppable in 2018, with only one loss in 36 matches. Her lone defeat came against Thai Ratchanok Intanon in January in the Malaysia Masters final. Ratchanok, the 2013 world champion, lost to Saina Nehwal of India 16-21, 19-21. The result was an upset on seedings but not on history. Nehwal has won 10 of their 15 matchups, including the last four. Nehwal, a former No. 1, faces current Olympic champion Carolina Marin of Spain next. Second-seeded Akane Yamaguchi of Japan eased past Nitchaon Jindapol of Thailand in straight games to advance, along with No. 5 Chen Yufei and defending champion Nozomi Okuhara, who plays third-seeded Pusarla Sindhu of India in a repeat of last year's final.